At first, it was just a premonitory tremor: the piecing together of a rudimentary whole human genome in 2001. Then, just two years later, came an earth-shaking eruption: the completion of the Human Genome Project. This explosive event rocked the molecular genetics landscape and released bioscientific forces that to this day show no signs of abating. Ceaseless flows of academic brainstorming and commercial innovation are reshaping old fields and creating new ones, ultimately spreading fertility to downstream disciplines such as epigenetics and epigenomics. When the genomic volcano blew, even the most far-sighted observers couldn’t anticipate the impact the reinvigorated and entirely new fields of biology would have in clinical mainstream medicine and therapeutics. Moreover, epigenetic links to neuroscience, neuropsychology, physiology, and a dozen popular disciplines of investigation have since been discovered. In essence, genomic and epigenomic frontiers have been opened. They are now being exploited by scientists determined to study the diversity of life functions, syndromes, traits, predispositions, and behaviors that contribute to health or wellness. At the forefront of the epigenetics field is a focus on the bromodomain and extra-terminal domain (BET) family of proteins that noncovalently and selectively bind with epigenetically modified (marked) amino acid residue sidechains on some histone protein subunits. Those histone protein subunits are found in chromatin. 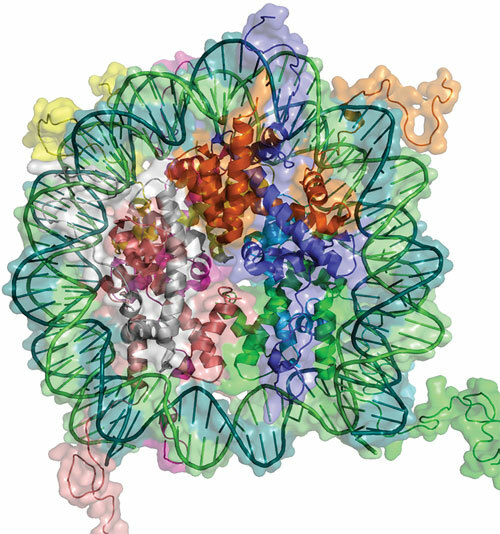 Winding around each histone is DNA, resulting in a compact nucleosome. When a succession of nucleosomes are connected by linker DNA, the result is chromatin’s “bead on a string” structure, which serves to compactly package DNA within the cell nucleus. In chromatin, the nucleosome-bromodomain-binding steric interaction conformationally induces multiple regulatory transcription effects on the affected genes within the wound DNA. Much evidence exists that rational, deliberate molecular interference or manipulation of this nucleosome interaction is often a potent means to beneficially alter the transcription pattern of a disease or biological state of disorder. New dedicated enterprises were founded to explore and discover the clinical manifestations of the BET interactions. Key players in bromodomain epigenetics work, especially as it relates to advanced clinical research, are Resverlogix and Zenith Epigenetics. (The former company, which launched in 2001 with an objective of exploring cardiovascular disease, spun off the latter company in 2013). Both companies are dedicated almost exclusively to bromodomain epigenetic regulation or transcription in chromatin research. They have a diverse repertoire of candidate products, projects, and experimental and clinical knowledge. Resverlogix’ current primary clinical candidate, RVX-208, now named apabetalone, is a selective bromodomain inhibitor for BRD4 at the BD2 site. It is in Phase III trials for patients with cardiovascular disease and diabetes mellitus type 2, and it is the only epigenetic drug candidate having such status. Zenith Epigenetics is devoted to oncology clinical research and has a bromodomain inhibitor, ZEN-3694, in a Phase I trial for a form of intractable metastatic prostate cancer (mCRPC). There are several renowned collaborating investigators and groups involved, including Eric Small, M.D., chief of the division of hematology and oncology at the University of California, San Francisco, and Howard Scher, M.D., chief of the genitourinary oncology service at Memorial Sloan Kettering Cancer Center. The inhibitor binds to two bromodomain sites, BD1 and BD2, with relatively good affinity at submicromolar KD resulting in a potent beneficial effect by upregulating certain tumor suppression gene programs. It also downregulates super-enhancer orchestration of several genes that are involved in transcriptions that promote pathogenesis is numerous hematological and solid tumor malignancies. Moreover, the drug candidate appears to work in a synergistic manner with standard-of-care chemo- and immunotherapy. Eric Campeau, Ph.D., is director of biology at Zenith Epigenetics. With reference to the Phase I study, regarding any transcriptomic and proteomic profile analysis of patients, he noted that the study involves subtype variations for therapeutic optimization. The first patient was dosed in June of this year. Donald J. McCaffrey, co-founding president and CEO of both companies, said that the firms were succeeding because they were not only adept at clinical research but also capable of unraveling biological complexities. While many other firms may have a single discovery platform, he maintained that his company has had a dozen developed scaffolds with many compounds in the proprietary bank that are well characterized and future candidates for trials. Aside from showing promise in the treatment of cardiovascular disease and cancer, the candidate inhibitors have demonstrated potential against many other diseases, such as chronic kidney disease and Alzheimer’s dementia. The company receives solicitation calls every week from corporate or governmental institutions such as the U.S. National Institute of Aging (NIA) for collaborating on projects, noted McCaffrey, adding that such collaboration proposals are encouraged since having a diversity of products and projects with widespread application potential requires specialized collaborators. The NIA is especially concerned with any drug that promises to lighten the societal burden that will be imposed by the dementia and debilitation caused by Alzheimer’s disease, a threat that looms over an enlarged segment of the population. According to McCaffrey, Resverlogix’ apabetalone, being a complement cascade modulator and having interaction with apolipoprotein A1, may have a two-prong beneficial action in early-onset Alzheimer’s disease. Ewelina Kulikowski, Ph.D., serves as senior vp of R&D at Resverlogix. When questioned about any other epigenetic projects that may contribute to the understanding of syndromes, disorders, or perhaps nondisease subjects, as done with genomic investigations, Dr. Kulikowski explained that it is well recognized that genetics and epigenetics play a role in various disorders and as the filed grows novel connections will be made. Moreover, in contrast to the genomic profile, epigenomic profiles are amenable to modification by not only direct pharmacological methods, but also by environmental or other external factors such as pollution, stress, diet, or nutrition. These factors may tap into biochemical pathways and lead to epigenetic effects through methylation/demethylation, or other means of marking of DNA, or through acetylation/deacetylation or writing/erasing of histones for subsequent bromodomain reading and trancriptive regulation of genes. Dr. Kulikowski referred to the work of Craig B. Thompson, M.D., president and CEO of the Memorial Sloan Kettering Cancer Center. Dr. Thompson has a focused project on the biochemical metabolic acetyl-CoA pathway-linked effects on the epigenome. The project encompasses the investigation of underlying mechanisms, such as those involved in altering the availability acetyl-donor molecules for histone modification. An analogous glutamine metabolic pathway link for methyl-donor molecules has been explored for epigenetic methylation of DNA and histones. Dr. Kulikowski also alluded to an orphan disease project at the company as well as a proof-of-concept trial that could further characterize the role of epigenetics in modulating critical pathways underpinning a number of rare diseases. Constellation Pharmaceuticals, primarily an oncology- and immuno-oncology-focused epigenetics company, has a BRD inhibitor, CPI-610, and an acetyltransferase targeted molecule, CPI-1205, in trials. Robert Sims, Ph.D., vice president of research, said that about eight other small molecules are in preclinical development. No neuroscience target drugs are currently being researched, but targets in other areas are of interest. These include targets in virology, inflammation, and immunology. As for nondisease projects, Dr. Sims pointed out that Constellation has developed epigenetic data-collating tools for interrogation studies that are available as an outreach to the research community. With respect to proteomics, he said that the company has expertise in histone proteomic analysis that has advanced its epigenetic biology knowledge base. He concurs that analysis by mass spectrometry has limitations and shortcomings in tertiary and quaternary structure analysis of the bromodomain-bound histone subunit conformational changes with respect to biological activity. When asked about future developments, Dr. Sims stated that the company’s main objective and current mission is to develop small-molecule therapeutics. Constellation is a privately owned venture that has a good portfolio of backing investors and partners. This portfolio has continued to expand since Constellation’s long-time partner, Genentech, ended a colloboration and backed out of an acquisition deal. There is no apparent consideration of a strategic merger or acquisition or public offering in the short term. Top biotech supply vendors also have an eye on the fast-moving epigenetics field. Their goal has been to provide researchers with efficient time-saving kits and equipment dedicated to the relevant experimental routines. PerkinElmer, for example, has a catalog of products ready for use as well as others in development. To keep apace of advances in epigenetics, the company has recruited specialized personnel from varied epigenetic research corporate or academic programs. The company anticipates that its experts, such as senior application scientist Daniel Cardillo, will leverage their familiarity with the experimental protocol literature to realize commercial vending opportunities. PerkinElmer has several histone-targeted assay kits. Some of them use homogeneous AlphaLISA for BRD4 and BRD2 binding and are useful for optimization investigations of inhibitors. Cell-based assay kits are ready for sale and in development for bromodomain protein readers. Epigentek and Zymo Research are among other vendors with strong portfolios of epigenetic research tools and supplies. As has genomics, epigenetics and epigenomics have shown a great deal of progress in a short time. These disciplines, however, also have become quite complex and complicated with the advent of new discoveries. One fact is certain. There is a deep and rich untapped resource of knowledge yet to be mined in these still young fields. Global alterations in the DNA methylation status of the genome correlate with various biological conditions, including development, aging and disease. Global hypomethylation of cytosines is a hallmark of cancer and primarily reflects the demethylation of DNA repetitive elements. “Likewise, global changes in the levels of the DNA methylation variant, 5-hydroxymethylcytosine (5-hmC), serve as a prognostic indicator in certain cancers and neurodegenerative disorders,” said Johanna Samuelsson, Ph.D., senior research scientist at Active Motif. To better understand how changes in DNA modifications influence normal and diseased states, methods to accurately quantify global 5-methylcytosine (5-mC) and 5-hmC are highly warranted, she pointed out. Active Motif offers plate-based assays to perform comparative studies of global changes in 5-mC and 5-hmC, according to Mabelle Ashe, Ph.D., marketing communications manager for the company. Likewise, the Active Motif Global 5-hmC Quantification Kit enables researchers to correlate shifts in global 5-hmC levels with specific biological processes, she added.